This medical malpractice claim was filed in Prince George's County after a man's leg was amputated due to a delayed deep vein thrombosis diagnosis. It was filed in Health Claims Arbitration on January 23, 2018, and it is the 40th medical malpractice case filed in Maryland this year. A man with a history of obesity, high blood pressure, and a right leg deep venous thrombosis (DVT, a blood clot) presented to the Emergency Department at Doctors Community Hospital complaining of constant left calf and foot pain beginning suddenly that morning. A venous ultrasound was negative for DVT and he was discharged a few hours later with instructions to follow up with his primary care doctor. Two weeks later, the man returned to the emergency department with escalating symptoms. He had intermittent left foot and ankle pain that got worse with walking, a "cold" feeling, and a sore between his toes. After an additional week went by, the man arrived at Prince George's Hospital via ambulance with severe pain, cold, and numbness in his left leg with no palpable pulse. A CT scan showed a large blood clot almost completely blocking blood flow to the arteries in his lower left leg. A vascular surgeon started him on medication in an effort to dissolve the clot. Over the next several days the man underwent two unsuccessful procedures, a thrombectomy and a femoral popliteal bypass surgery, before he was transferred to Washington Hospital Center for a stent angioplasty. The angioplasty was unsuccessful and the man ultimately required an above-knee amputation. "Thrombus" is the medical term for a blood clot, so deep vein thrombosis occurs when a blood clot forms in a deep vein, usually a vein in the leg. The blood clot can block blood flow to the leg, or it can break off and travel to the lungs, causing a pulmonary embolism. Either way, DVT is a serious life- and limb-threatening condition. The claimant in this case had a classical presentation of DVT: pain in his calf that might have felt like cramping or soreness. He also had several alarming risk factors, including obesity and a history of DVT. All things considered, the emergency department staff should have performed more diagnostic tests to thoroughly rule out DVT before releasing the man from the hospital. When the claimant first arrived at the Doctors Community Hospital Emergency Department his symptoms were relatively mild, implying that he was experiencing the early stages of DVT and his left leg was still benefiting from some blood flow. If the DVT had been diagnosed at that point, it is highly likely that he would've made a full recovery. When an extremity is cool to the touch, like the claimant's leg upon his return to the hospital, it is an indication of severely restricted blood flow. The plaintiff's statement of claim doesn't include much information about the second Doctors Hospital visit, but it's difficult to rationalize discharging a patient with such obvious symptoms of a blood clot. Emergency Medicine Associates, P.A. d/b/a Emergency Medicine Associates, P.A., P.C. Failing to appropriately examine the claimant for a blocked artery. Failing to perform a vascular exam or any diagnostic testing on the claimant's first visit to Doctors Community Hospital. Failing to consult a vascular surgeon. As a direct result of the defendant health care providers' negligence, the claimant suffered additional medical procedures, economic loss, and permanent injury that resulted in the loss of his left leg. View sample personal injury verdicts and settlements from Prince George's County. Take a look at other cases against Doctors Community Hospital. 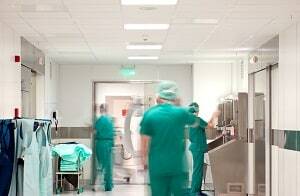 Learn more about emergency room medical malpractice lawsuits. Read about a similar claim filed in 2016.